So there are, of course, squillions of amazing quirky wedding venues in Liverpool. We are inundated with amazing halls, houses and hotels. But I know that you are looking for something a little bit unusual. An amazingly quirky Liverpool wedding venue that will wow your guests, but more importantly, hold your awesome party in just the way you want it to, so that you can chill out, relax, eat drink and be very, very, merry on your day. So, because I’m nice like that, I have compiled a list of all my favourite little gems. The WOW places that just make me fall in love every time. Before we start, not all of the venues on this list are licensed for ceremonies. It’s good to check this link on the Liverpool.gov website HERE to find all of the places in Liverpool that can legally host wedding ceremonies. So here’s the list. I love them and I know you’ll love them too. And if you want me to photograph your awesome day there? Well that would be even more awesome. Just give me a shout here. I LOVE this place. As quirky Liverpool venues go, it is the bees knees. Not only does it do the BEST Sunday Lunch in Liverpool, and appeal to my slightly hipster-ish tendencies, it also holds weddings. I mean, WOW. The huge space would be just amazing for a wedding, with room for as many of your crazy ideas as you could shake a stick at. Perfect for big weddings, it can hold up to 300 (!) of your nearest and dearest with lots of space for dancing the night away. What’s more, the food is to die for, with amazing picnic style wedding breakfast menus including ‘Honey glazed coca cola glazed gammon, apricot & pineapple ketchup’ and ‘Chorizo pigs in blankets with onion crumble Yorkshire puddings’. I’m quite literally salivating at the prospect. To top it off your guests can feast on huge sharing platters of dessert, and amazing cocktails. You can even upgrade to a late licence and party the night away until 4am! Perfect for party animals. Find out more about weddings at Camp and Furnace here. Can you imagine anything more beautiful than a wedding in a restored Victorian greenhouse? Its just so lush and green, with gorgeous tropical flowers, plants and ferns festooning the lovely building. Plus, the light is AMAZING, which might not sound exciting to you, but its something us photographers go all gooey over. It would also be the perfect backdrop for gorgeous bunting, colourful lanterns and festoon lighting, but would look equally stunning with no decoration at all. Just gorgeous. For more information, visit their website here. I love Oh Me, Oh My. Its such a versatile space, with lots of cosy little nooks for your guests to chat and chill, as well as plenty of space for an awesome party with lots of crazy dancing! The crowning glory though? An incredible roof garden with the best views over Liverpool, looking right out onto the Liver Building- just perfect for some cracking pictures! 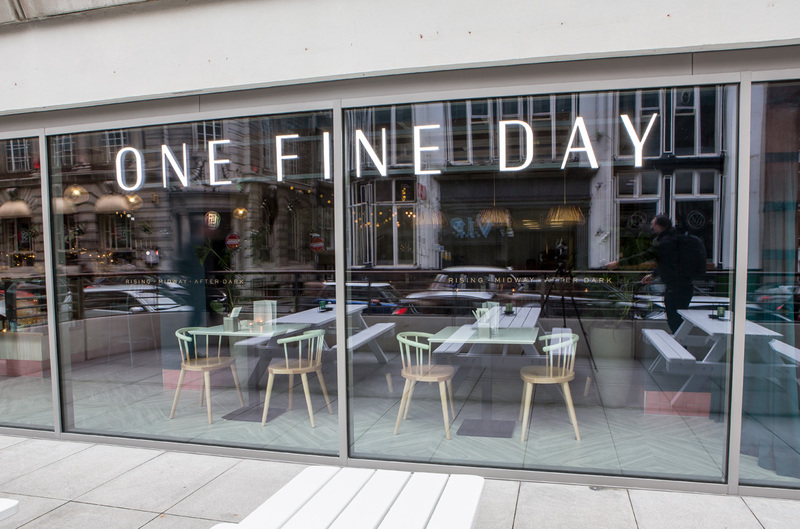 The food is incredible too, especially the afternoon tea- so a must-see for foodies! Amazing outdoor drinking spots are few and far between in Liverpool. But this little gem, in the heart of the Baltic Triangle, is just bloody beautiful. I love what they say on their website- its enough to make me book and I’m already married: “It’s creative, outside-the-box and irresistibly unique. Whilst rich in character, the venue takes pride in offering couples a blank canvas upon which to paint their perfect wedding. Laid back and unassuming, the bar & reception offers guests a cosy environment in which to come together and celebrate”. How bloody awesome does that sound? Everything they offer is totaly bespoke, which is great for creative brides and grooms with awesome ideas! Have a look here. And now for something really quirky. how about celebrating your marriage in an incredible clank-canvas warehouse space? Describing themselves as “a completely private space, with no public access – a place for creatives to realise their dream of a quirky, unique and truly-personal wedding.” Located in the Baltic Triangle, it has a real party atmosphere and is totally customisable- I absolutely love it! The Bluecoat Contemporary Arts Centre is just gorgeous. A perfect venue for creative couples. It always feels like such a calm, relaxing space, and again (sorry, photography geek) the light is beautiful. Its also right in the centre of town, so great if you want a little wander during your couple’s session to take in photos with the Liverpool hustle and bustle. A fab mix between gorgeous traditional exterior (it’s Liverpool’s oldest city centre building!) and light, airy modern interiors, it really is beautiful. Visit their website here. Another Baltic Triangle venue. There’s just something so effortlessly cool and fun about that area. I can always while away a day there, and its a great place to spend your wedding day! Siren itself is a fab modern space, with gorgeous sweeping windows letting in tons of lovely light. The food is epic- I mean just look at those sliders! They also have a gorgeous roof terrace with the most amazing views of the city- I bloody love a good roof terrace, can you tell? They have had couples use the roof terrace for paper aeroplane fights and giant jenga tournaments, silent discos and even a first dance! It’s a perfect venue for more intimate weddings. They can hold up to 40 guests for your wedding breakfast and up to 100 evening guests. Have a look at their wedding guide here. If, like me, you love a bit of history, this is the venue for you. Known locally as a hidden gem, this museum is a treasure trove of curiosities, oddities and unusual finds.With exhibitions about the history of false teeth and zoology, there’s a huge range of pieces to explore – all set within a building with its own unique history. It is an amazing,Gothic building with an incredibly grand entrance hall to wow your guests. My favourite thing about this wonderful place is the Gothic architecture and the beautiful tiles- i’d quite like to pinch some for my bathroom! Have a look here. Not just an awesome night out, now you can get married at the awesome Ghetto Golf! Ghetto Golf is the venue that has a seriously twisted 18 hole mini golf experience, an exceptional cocktail bar, top local DJ’s and captivating graffiti artwork. The fun doesn’t stop there, there is a cosy outdoor bar and they have BBQ masters, Apocalypse Cow to entice you with their delicious street food! And it’s all housed within the old Cains Brewery, so come join the party! Just the coolest place- the food is incredible and I’m dying to try their Punk Afternoon Tea and Bottomless Brunch! Located in the Baltic Triangle area of Liverpool (I know you’ve guessed by now that the Baltic Triangle is my spiritual home!) I just LOVE the colour, the mis-matched furniture and the epic urban feel Great for cool, edgy foodies. One Fine Day is the most beautiful place! I absolutely love the timeless elegance of it. It is steeped in history, located in the old cotton district, and it has been lovingly restored, which I adore. Plus the food is bloody epic too! It is the perfect space for larger weddings, offering a seated capacity of up to 165 and standing space for 350, it also features a private entrance and relaxing mezzanine area for guests. 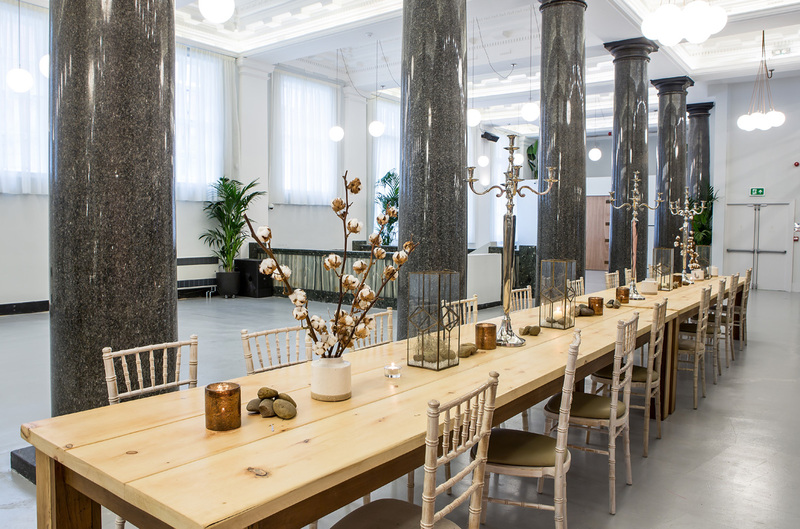 Available for wedding receptions and parties, the venue is perfect for couples seeking a venue in the heart of the city that oozes understated elegance with a contemporary twist. Now I wouldn’t ordinarily recommend a church. Let’s face it, they’re not often the most exciting places in the world. But Ullet Road Unitarian Church is different. The church itself is stunning, a big imposing Gothic building with the most incredible stained glass windows, perfect for more alternative Liverpool weddings. Your ceremony here can be totally personalised- during a wedding I shot here, the couple totally turned the idea of traditional hymns on its head and had their guests sing 80’s rock songs including Bon Jovi’s “Living On A Prayer”, accompanied by a string quartet. It was so funny, and absolutely everyone joined in. I’ve never laughed so much during a church ceremony in my life! Plus, it has a stunning village hall for your reception right next door, and Sefton Park is directly across the road- perfect for your epic couples shots! Fancy celebrating your wedding day in one of the best gig venues in Liverpool? Of course you bloody do!! Invisible Wind Factory is a huge event space with the most incredible lighting set up, and the potential to create an absolutely AMAAAAAAZING party. 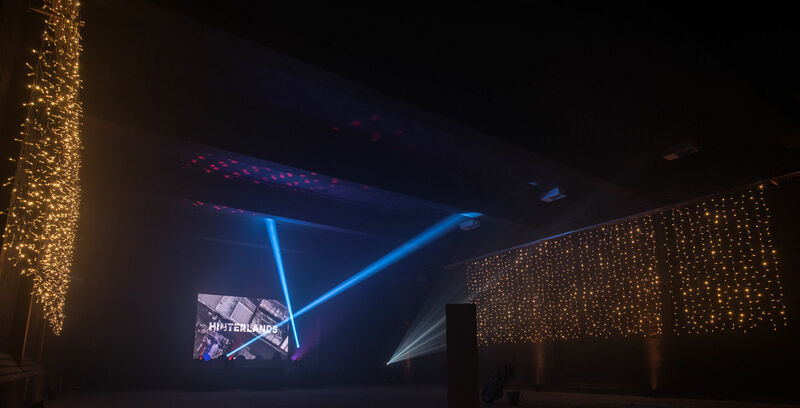 Created by The Kazamier, its run by artists, so they can offer real creativity- think bespoke ‘set design’, incredible lighting, and space for live bands, performers, street food and more. So that’s it! My list of awesome, super-chilled quirky wedding venues in Liverpool for couples who like to do things differently. Is there somewhere I’ve missed? An epic, awesome venue that needs to be shared? Let me know. Are you planning your wedding here in Liverpool, and are looking for a fun photographer who gets you? Who understands that you just want a fun family party with no fuss or frills, and want your photographer to be a relaxed and supportive friend, whilst capturing all of the fun and joy of your wedding day? Well give me a shout, I would be THRILLED to be part of your day. Or, go and have a look at my portfolio or blog for more wedding inspo.